Both Royal Caribbean and Carnival call the Galveston cruise port home and visit a variety of places on their many itineraries. For many the choice between the two is a matter of personal taste as both lines have unique and interesting things on board for their guests to enjoy. Cruises from Galveston to the Bahamas on Royal Caribbean allow you the freedom to enjoy many of the line’s ‘first at sea’ experiences like the skating rink and the rock climbing wall. Pools, sports, an adult only solarium, Broadway style shows and an on board casino are only the beginning of the fun, as Royal Caribbean strives to make your vacation one to remember. Learn a new skill, a new dance or a new language, or attend wine tastings and cooking demonstrations. If you prefer, you can simply wander the open air decks where the sea is the star of the show, or gaze at the ocean through the walls of windows that have become a trademark of the line. On a Royal Caribbean cruise from Galveston to the Bahamas, you can enjoy 7 nights on board with stops in Roatan, Belize and Cozumel, or the itinerary that includes stops in Cozumel, George Town and Falmouth in Jamaica, also a 7 night affair. Carnival’s world renowned ‘fun ships’ can take you on cruises from Galveston that run anywhere from four to seven days at sea. Take your pick from jaunts to Cozumel and back, trips to Progreso and Cozumel or 7 day trips that either stop in Mahogany Bay, Belize and Cozumel; Key West, Freeport and Nassau, or Montego Bay, Grand Cayman and Cozumel. Carnival has Camp Carnival for the kids and plenty please everyone in the family once on board with their Dive-in Movies, live music, stage shows and Carnival Waterworks Splash Park. A cruise from Galveston to the Bahamas on Carnival also offers plenty of duty free shopping, pool deck parties and of course, the on-board casino, spa and fantastic dining choices. 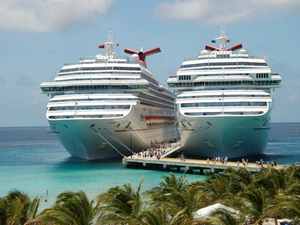 Two of the best cruise deals from Galveston at the moment come from these cruise lines with Carnival offering their 7 day Key West, Freeport and Nassau cruise starting at just $569 pp., a savings of up to 66% for their April 14th sailing. Royal Caribbean, likewise, is offering their April 14th sailing from Galveston to Cozumel, Grand Cayman and Jamaica for $759pp. for 7 nights. Pick your line, pick your destinations and then sit back and enjoy your cruise from Galveston to the Bahamas. Fun in the sun is just a spectacular sail away.